I know we’re a few days past the Easter holiday, but truthfully, if we celebrate Christ in our lives every day we’re celebrating Easter; and this thought came into my mind and my heart yesterday and I needed to share it, as I’ve not been able to stop thinking about it since that time. The story of the woman at the well paints such a marvelous picture of salvation for the child of God. An interesting note about this story is that it’s the longest recorded conversation that Jesus has with any one person. And it happens to be with someone He, twice over, should not be talking to according to Jewish law. One a Samaritan, and two a woman. And yet, the Lord doesn’t stand on the formality of religion but rather He goes for the relationship. I love that about Jesus! So here He stands (or sits, because He was weary) talking to this woman who came to the well in the hottest portion of the day, most likely to avoid people judging her, and she meets the only One worthy to judge. There’s probably a thousand points in this story, but today I’ll mention three. The Samaritan woman came to the well prepared to get her own water and head back to the house before any of those judgmental people of her city came around. She’d had four failed relationships and was working on the fifth. She’d been let down so many times before, she knew better than to rely on anyone else to take care of her, she could take care of herself. Or so it is that I think of her. And independent woman. Her attitude with Jesus seemed to be almost sarcastic when she says “Sir, thou hast nothing to draw with….” In other words, Mister, You came here without a bucket! How do you plan on getting water? This is what I love about the Lord, and reading His word. 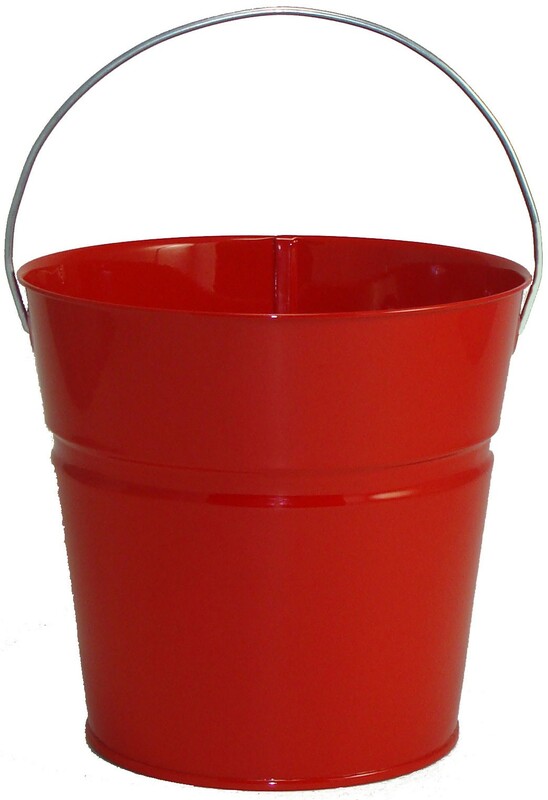 In the Bible according to Shari, the one that plays out in my head when I hear or read the Word of God; the one that sometimes adlibs, I hear Jesus saying… Woman, I am the bucket! I have everything you need to sustain life. You can drink of what this world has to offer for the rest of your days but at the end you’ll die of thirst because you can’t live without me. I don’t want to come here again. Woohoo! And Hallelujah, does that story ever put a shout in my soul! If the woman had a name tag, and she doesn’t, it would likely bear our name. She every one of us who comes to Jesus with our unholy bucket trying to cleanse ourselves, and it never works. But Jesus isn’t at the well any longer, He is the well. Because of the cross of Calvary we now have that Easter Bucket of endless living water that will allow us to live eternally with our Lord, but for now will allow us to live effectually for our Lord. For now we have purpose. There is so much in this story I can’t possibly do it justice in a blog, but after she finished her business with the Lord at the well, she went back to the city. This time she wasn’t avoiding people she was looking for people unashamedly to tell them what the Lord had done in her life! So… have you been to the well? If you not… go quickly! If so… tell somebody!!! Nine months ago Victory Baptist Church set on the brink of uncertainly with our Pastor of 21 years leaving and there was a gamut of emotions within me. I feared being leaderless, I had concerns over what a new leader’s ideas might be and what my role would be in the church, I had trepidation for my co-workers in Christ, how would they weather this storm we were about to go through and would the storm be a breeze or would it be an f5 tornado; and who would be left standing when the wind died down? I had faith that I’d be one of them, but also the reality that I’d seen many others in the faith who’d walked away from God in good times, so I knew I wasn’t invincible. Over nine months we’ve gone through the F5 phases of transition: fear, fret, frustration, fatigue and praise God, faith! So last night as I watched my new Pastor, Steven Carter, announce his resignation to his current church my heart sunk a little for them. Not as much, because their circumstances are far different from ours; he was a co-pastor with his father. Therefore their transition is more the adjustment to the filling of roles that Pastor Steven played and missing his family’s presence in their congregation, which I don’t make light of. Things that are different are not the same… I think someone wrote a book about that once. Oh yeah… my new Pastor’s father! But even though our circumstances are different, there is one thing for certain, the transitions in life are usually only enjoyable at completion. That middle part… it’s rough. It’s great when we get to the position in life where everyone’s comfortable in their place and content with that stage of life, but when things are a little shaky and uncertain there’s a humility necessary. You tend to rely on one another more and turn to God more frequently than before. I’m speaking tomorrow at a ladies retreat about how “epic failure equals expert.” So can transition. It’s a learning experience. Now that we’re almost to the other side of this phase in our church we can draw from that for future transitions. This was a first for many of us. I’d had only one Pastor since salvation in 1996, that’s about to change! I’ve seen others not fare so well in the transition. Their f5 was full of fault finding, falsehoods, forsakenness, foolishness and fussin’. And what it left was devastation. Transition success is relational. It’s not leaving one to never return, it’s about moving down the road to the next phase. The road’s still open (unless you burn the bridge). But it’s good to travel back down the road from whence we came and pull from those experiences, and talk to those people to remind us of the lessons we learned in that phase. That’s why transitioning correctly can make you an expert. Is Victory Baptist Church an expert? We had less than glowing moments, but they were short lived. And because of that, the ties that bind us are even tighter. We depended on each other, a lot! We talked a lot along transitions road, sometimes healthy conversations, sometimes not. But the point of the matter is as we’re nearing the end of our phase, another church is just beginning theirs. Life…. Forever changing. It’s best to stay in the slow lane when transitioning from place to place, enjoy the view…roll the windows down and get some fresh air… stop and ask directions…. Fill your tank up… keep travelin’…. Enjoy the destination when you arrive. But don’t drive your tent pegs too deep! Four o’clock came early this morning but as soon as the alarm went off my first thought was. Good morning Lord, it’s Easter! This is the day you arose and changed the very fabric of our lives. When the veil was torn in the temple there would no longer be a separation between God and man. The privilege once held by the Priest alone, now belonged to the common man… or the common Shari as it is with me. I woke up as excited as if it were Christmas, which I guess is appropriate being that the reason we have Christmas is Easter. This was Christmas’ purpose. Resurrection Morning! This day is what brings hope to all the bad days. This is the day that overrides every heartache in life. God’s ultimate heartache, the forsaking of His Son now gave way to the restoration of man. God opened His Christmas gift that first Easter morning when He opened up the tomb and walked out. Just to write those words causes my heart to leap with jubilation!!! How must God have felt that first Easter morning? From the cross He spoke “It is finished.” From the tomb, it’s just beginning! Merry Christmas Lord… Happy Easter! If you think I’ve lost my mind you may be right, I hope it’s because I’m getting closer to the mind of Christ. But today I have joy unspeakable for what Christ has done in my life. I hope today that you know that joy; that peace on earth and good will to men that we speak so often of at Christmas time. Because were it not for Easter, there would be no peace. If you don’t have that joy, there’s an easy remedy. Right now, where you are ask Jesus to be Lord of your life and trust Him from this point forward for everything. Believe that He was born of a virgin, that He walked the earth to experience life as you do except without sin because He is God. Believe that He died on the cross to pay for the sin you experience and to put an end to death and give you an eternal hope. There’s still going to be heartaches down here, but because of that first Easter morning we have hope that every heartache has a reason and will for certain pass. Make today the day that you give all that heartache to the One who took it upon Himself on the cross of Calvary. Of late my creativity has had new life breathed in it… partly because of something that has consumed much of my time, the preparation for the Easter Cantata at Victory Baptist Church on the evening of Sunday, April 20. My contribution to the cantata is to paint the thoughts stirred in my soul by the Cantata songs before a live audience. The songs are just a few minutes long so needless to say I can’t complete and entire a painting in that length of time, my alternative is to “finish” each painting in 4-5 minutes…. I know… that’s a lofty goal and one that I always think “what were you thinking!” after I’ve volunteered. So 7 paintings in about 40 minutes, again… WHAT WAS I THINKING! I’ll tell you what I was thinking… I’m a fool for Christ, and just foolish enough to believe God will allow me to complete each one. So for the past few weeks I’ve been painting the foundation of these seven ideas… Today I’m painting their back drop (branches) which is consuming much more time than I had planned. So for a quick post idea I thought I’d share some of the Facebook doodles I’ve been posting lately… I’ll call them Bloodles. (Half blog… half doodle) Thanks for loving me, please pray for me as I prepare for this awesome weekend ahead… the one that changed the world, including me!!!! LATE DAY DOODLE 4-16-14: you’ll protect your family from anything harmful, right? Hell’s harmful and forever. Please… Take your children to church. How much more He loves us! One of my Dad’s favorite verses… mine too…. And when they came to Marah, they could not drink of the waters of Marah, for they were bitter: therefore the name of it was called Marah. And the people murmured against Moses, saying, What shall we drink? The water was not the only thing that was bitter, so were they. Why had God brought them to this place with a promise of prosperity and then sat them before bitter water? That hardly seemed right. He’d called them His chosen, the favored of Heaven, should not they be drinking bottled water from the finest of springs? I just realized that I blogged this passage two days ago, so obviously God has a message in it for us, what is it about that bitter water? There were several notable quotes throughout the day, I’m sure someday I’ll make them mine and totally take credit for the genius, but I can’t take credit, nor give credit for the one I’m about to write because I didn’t take down who spoke, it was said in passing and it stuck in my mind like gum to the bottom of a summer shoe. Is that deep or what? Not only deep but true. All three of the women from the retreat were not murmuring, but rahter using the bitter waters that they’d had to drink to pour sweetness into the soul of other hurting women. Other women who had stood before the same bitter waters. This morning I’m so humbled to be a part of that spiritual house in Heaven and the holy priesthood on earth. I hope you understand that regardless of where you are or who you are in life, you are special in the site of God and worthy through His blood that was shed for you. To “taste” is to experience. Savor the blessings of life and share that goodness with everyone you meet. Grab your timbrel and dance! So again I’m excited… A new Pastor’s on his way, I’m heading to a ladies retreat in Virginia for the weekend, and Sunday is just around the corner. Woohoo… life is good! This morning I’m away on business so I’m in the lobby of a hotel, thinking about the goodness of the Lord. Grinnin’… probably causing the lady that is setting up breakfast (and not overly happy about it) to wonder why someone would be so joyous at 6:05 in the morning. Perhaps I’ll have the opportunity to explain it to her but for now I’ll revel in the Word of God which has my heart stirred this morning. I encourage you to read Exodus 15 this morning. What a chapter of victory! Moses is singing a song (and it rhymes, I love that!) Israel is reminiscing about Pharaoh and his band of merry men being swallowed up in the sea and I would suppose that all of us can identify with the feeling of being pursued in such a way that you absolutely thought it was curtains for you this time; only to be snatched from the jaws of death by almighty God! I love that too! Those scriptures of victorious living this morning had me on shouting ground and then I read once verse too far. Actually, I’ll consider it a warning having just come out of a consuming sea kind of time in my life. The warning is this… we’re just a few words from a complaint. I almost laughed. You’re worried about water? God just split the sea, walked you through on dry ground, destroyed your enemy with the same water and you’re worried about what you’ll drink? Oh my goodness… I’m pretty sure these people were Baptist! We’re always looking for the next failure! So God just brought us through, what now? I want to remember this scripture when the new Preacher arrives and we’re tempted to complain because something is going according to plan. I want to remember the bitter water and remind myself to add a little sugar and drink it any way. Well… my days starting early… no time to finish this thought like I’d like too, but just a reminder to you and I both, Grab your timbrel and Dance!!! !